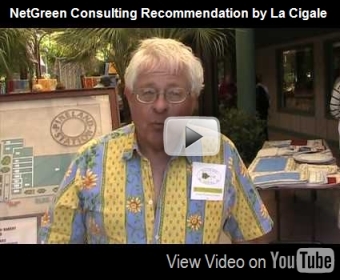 NetGreen Consulting - Sample Client Websites | NetGreen Consulting, Inc. Many of them had existing websites that were either poorly designed or lacked features such as an online catalog or e-commerce functionality. Most of them wanted to be able to edit and update their sites anytime they wanted instead of trying to call or email a webmaster and hope that they’d get a response. Some were even “abandoned” by the person or company that originally setup their site due to loss of interest or going out of business! We’ve also worked with a number of folks who just needed a few “tweaks” or updates to their current sites while maintaining their existing hosting service – no problem! We’ve also done a good bit of search engine optimization work for folks whose sites were developed by someone else, but they were not getting found by potential customers – or even listed in the search engines! The customers and sites shown below are a sampling of our website design and support work – over 40 sites in all! A number of our customers have been so pleased with our work that they’ve referred us to other businesses and gave glowing recommendations on our behalf. We appreciate all of them and have enjoyed the opportunity to partner with them in growing their online business or organizational capabilities. 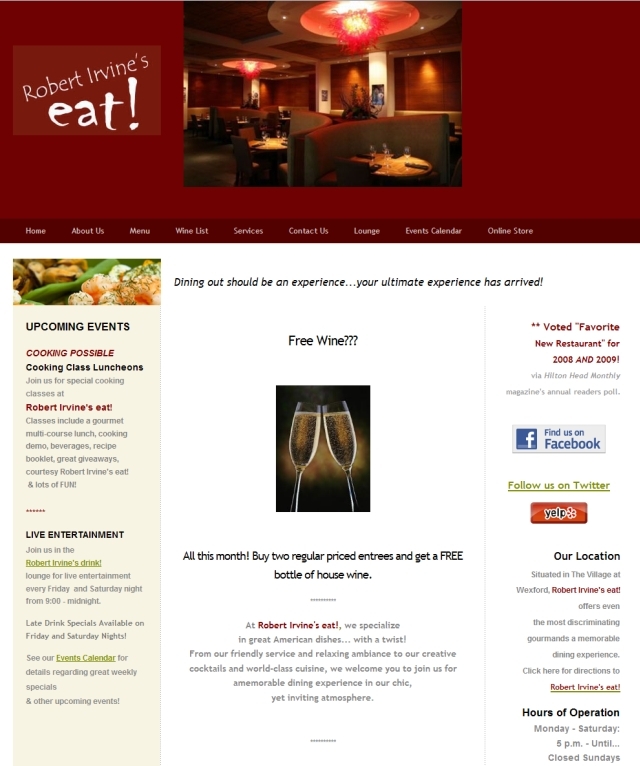 Click on any of their website images below to view a larger image of their site. 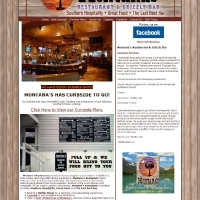 Montana's Restaurant and Grizzly Bar in Bluffton was trying to work with another website developer to get a site up and running, but it was taking forever to get anything done. 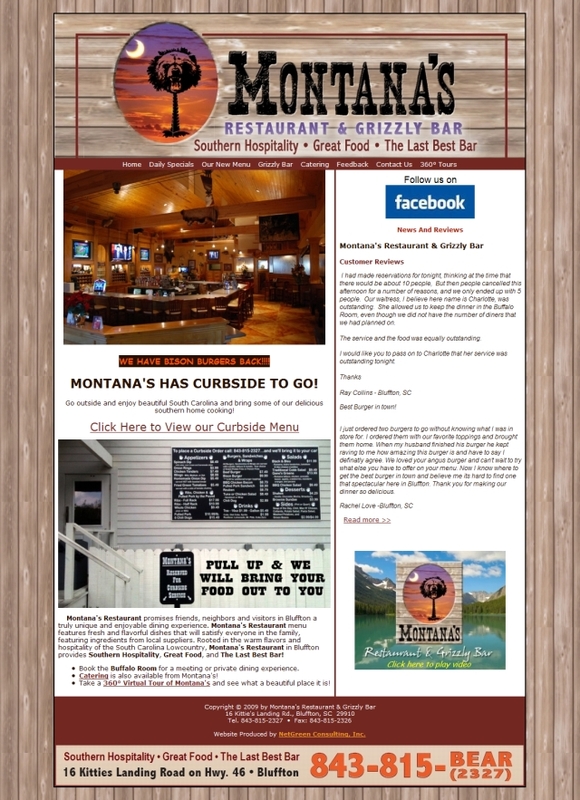 We worked with the restaurant manager to setup their site and implement a Flash video, a slideshow, and a link to their Facebook page, as well as providing them with the tools and training to update their website (including their menu specials) daily. When Robert Irvine's "eat!" 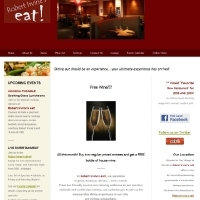 restaurant opened in Wexford Village on Hilton Head Island, they asked us to develop a website for them. We setup a site that they could manage and update, and they have added a number of new features including an online store and calendar or events. 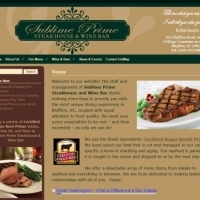 It's tough to open a new local steakhouse and compete against national chains! 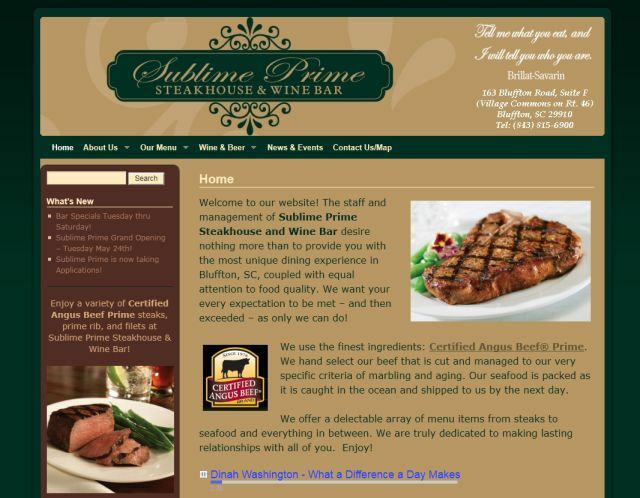 Sublime Prime owner Karyn Goldberg came to us for help with a website that projects their fine dining image and brings in visitors - and we have succeeded! As she told us: "It's nice to work with people that do what they say they will and you have done EVERYTHING perfectly. Thanks!" You're welcome, Karyn, and we know folks will love your steaks as well. 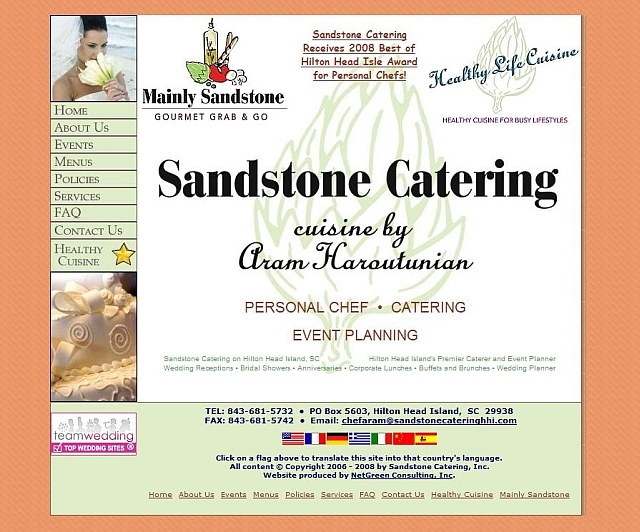 Chef Aram Haroutunian was just getting his new personal chef and catering business up and running on Hilton Head Island when he came to NetGreen Consulting for help in establishing an Internet presence for Sandstone Catering. We developed the site layout per Chef Aram's vision and also created the Flash intro for it, after which he took over site updates. 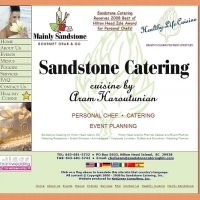 Their site now consistently ranks in the top 3 Google search results for the terms 'hilton head catering' and "catering hilton head'! 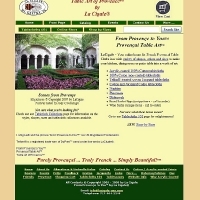 La Cigale is a PA importer of French tablecloths - "From Provence to You"™ They had a website with ecommerce capabilities, but it was too difficult to maintain and use. 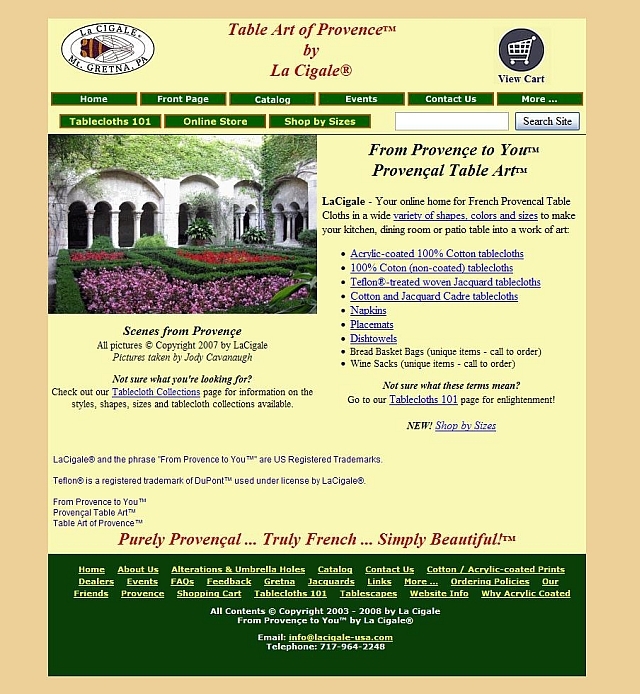 We met them at a one of their local distributor's outdoor shows in 2005 and worked with them to develop a dynamic ecommerce-enabled site with over 300 items available for purchase online. They also keep a calendar of events online so clients can visit their booth at garden shows and fairs. 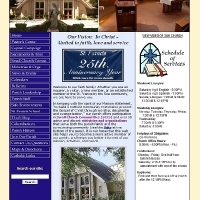 When we started, the church's existing website was little used; the only information that they could add to it was the weekly bulletin (sent by email to the former webmaster). We worked with a small group of their staff to create a site with a wealth of information and links - over 70 pages! 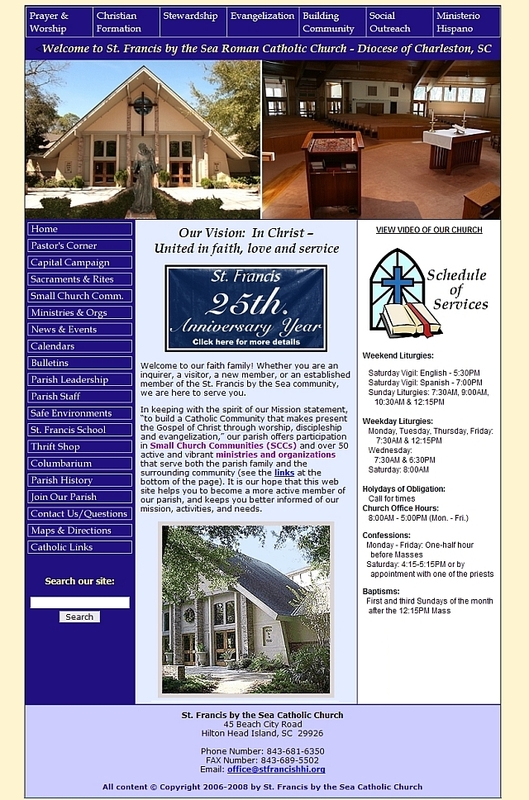 It is now getting over 100 hits per day and is regularly updated with the latest information regarding parish news, services and events, including a special 25th Anniversary page with movies and slideshows. 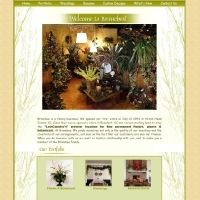 Tom Ventimiglia and his daughter, Lauren, had two shops in Hilton Head and Beaufort, SC, providing decorative artificial florals and botanicals. 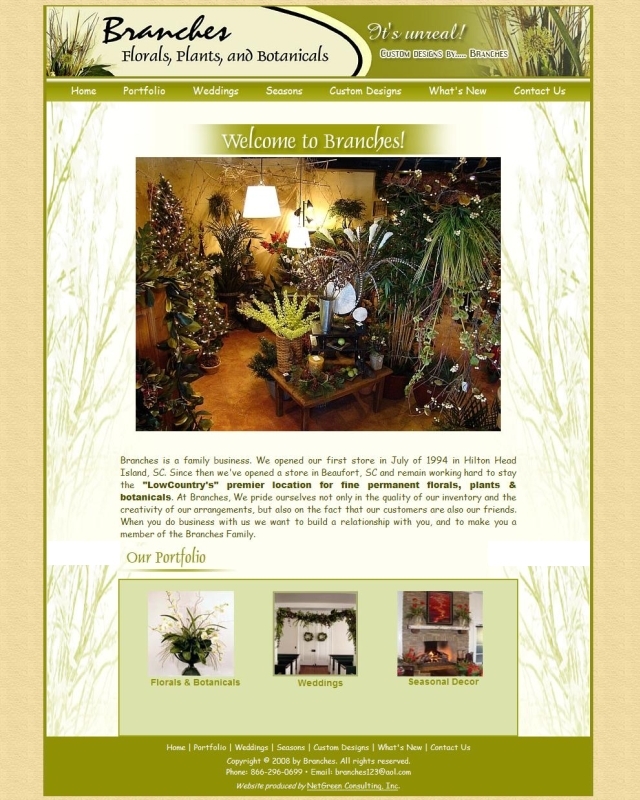 Their existing website wasn't meeting their needs to promote their business and didn't allow them to update it with seasonal changes. 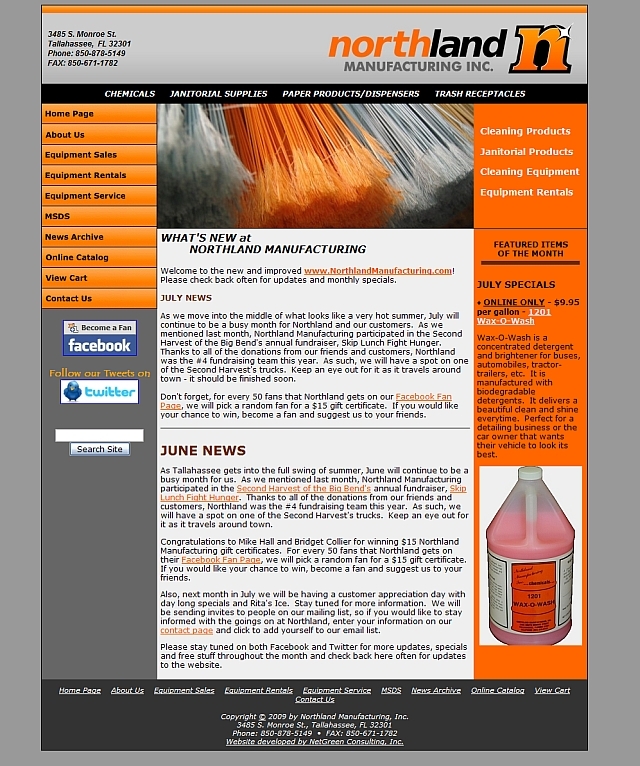 They called on us to provide a new website that they could update themselves and have been busily adding content. 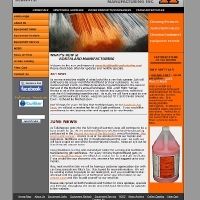 Northland Manufacturing is a Florida company that manufactures and sells cleaning chemicals and equipment. They had a website that hadn't been updated in 7 years! They contacted us to do a complete re-design of their site, including the ability to provide a catalog of items for sale and to take orders and process credit cards online. Their new site now lets them update their monthly specials, link to their Facebook page, and process online orders from their customers. 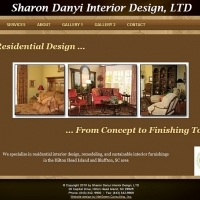 Sharon Danyi, an Interior Designer on Hilton Head Island, had old site that had been sitting unchanged for years - and she had no way of updating it. 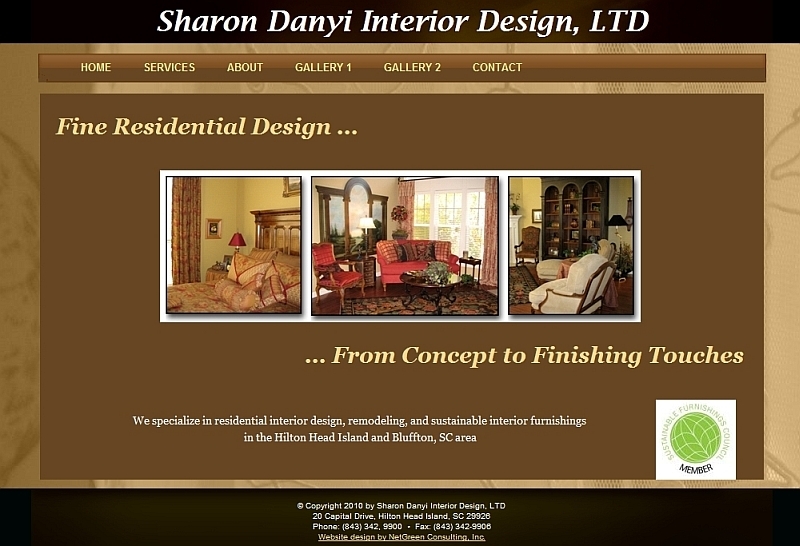 We worked with Sharon to incorporate a new photo gallery of her design work (actually TWO photo galleries!) and information about her ASID and Green AP certifications into a new layout for her site. She wanted a new layout using earth tones that still had a touch of simple beauty to it. The new site is a major improvement over her old one – and now she can update her own website whenever she wants!